Οι αγώνες στο America's Cup World Series στη Νάπολη ξεκινούν σήμερα το απόγευμα, με τον Dean Barker, ΕΤΝΖ, να προηγείται με μόλις έναν βαθμό διαφορά από την Oracle Racing του Spithill. Η νέα ομάδα στο παιχνίδι είναι η Luna Rossa, με τα δυο σκάφη της αναμένεται να είναι από τους πρωταγωνιστές ειδικά μέσα στα πάτρια ύδατα. Το Artemis Racing προς το παρόν είναι τρίτο στην γενική αλλά σίγουρα θα θέλει να κάνει κάτι καλύτερο και η Team Korea με νέο σκίπερ τον πολλάκις παγκόσμιο πρωταθλητή Nathan Outteridge θα πιέσει πολύ δυνατά. Η Energy Team στον προηγούμενο αγώνα στο San Diego ήταν η έκπληξη με την καλή της απόδοση και αυτό θα προσπαθήσει να κάνει και στη Νάπολη και τέλος η China Team με νέο σκίπερ και αυτή, τον Fred Le Peutrec, έρχεται ανανεωμένη από τη νέα της βάση στη Sanya και θέλει να εκπλήξει τους πάντες. Η συμμετοχή του κόσμου μέχρι τώρα στα δοκιμαστικά ήταν εντυπωσιακή και ο Paolo Graziano, Πρόεδρος της διοργανώτριας αρχής στη Νάπολη, υπολογίζει ότι το κοινό θα ξεπεράσει τις 250,000. Στην Ιταλία το Σαββατοκύριακο ήταν το Πάσχα των Καθολικών και επικρατούσε ένα εορταστικό κλίμα. Ο Yves Carcelle, CEO της Louis Vuitton, που είναι 30 χρόνια χορηγός του AC, είχε την ευκαιρία να βρεθεί ως επισκέπτης πάνω σε ένα AC45 και δήλωσε μετά ότι "είναι πολύ περισσότερο σπορ τώρα από ότι ήταν παλιά με τα μονόγαστρα σκάφη, πρέπει να είσαι σε πολύ καλή φυσική κατάσταση. Η κίνηση δε σταματά ποτέ στο τέλος της μέρας οι ιστιοπλόοι πρέπει να είναι εξαντλημένοι." Dean Barker, skipper, Emirates Team New Zealand: (Sailing the AC45s) is great, it's a different challenge to what we've experienced in the past. The adrenalin from sailing these boats in a big breeze is very hard to explain, but coming in after a day’s sailing it's pretty hard not to have a big smile on your face. 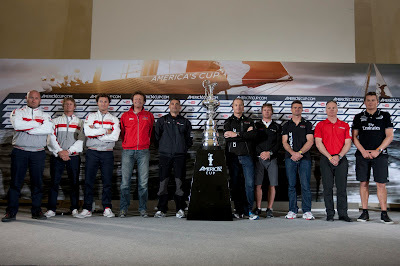 James Spithill, skipper, ORACLE Racing Spithill: The game has changed, the racing is right next to the shore. 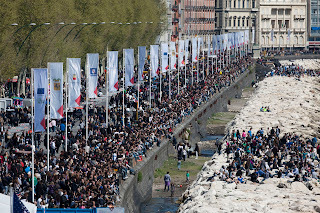 It was exciting yesterday (Monday) to see the crowds and I think they will be even bigger next weekend. 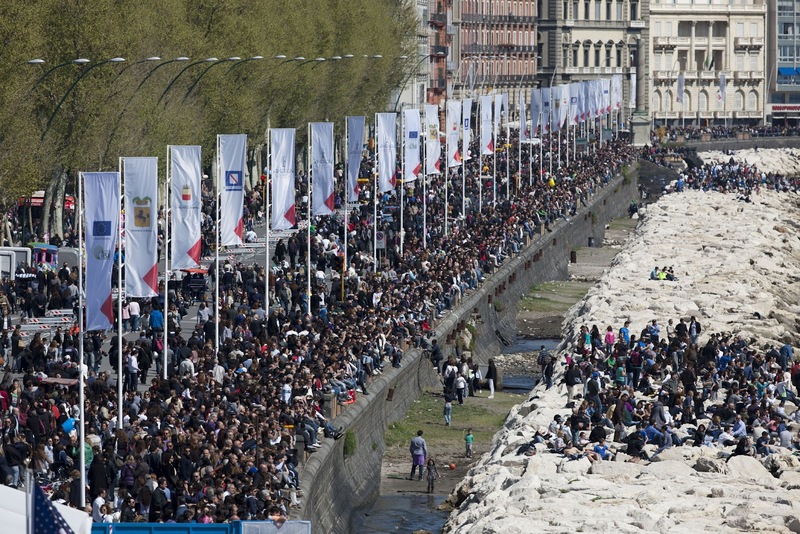 The exciting thing for the sailors is you can hear people cheering. It's like being in a stadium. That's one of the coolest things, to go around the course and hear people cheering… The Italian fans are the best in the world and they'll make this event fantastic. Terry Hutchinson, skipper, Artemis Racing: Over the past couple of days we've had a lot of weather and rain moving through, so with the mountain behind the race course it wreaks havoc. But the forecast is more for the traditional sea breeze we were after. I think it's going to be a very challenging race course with all of the geographic effects around here. 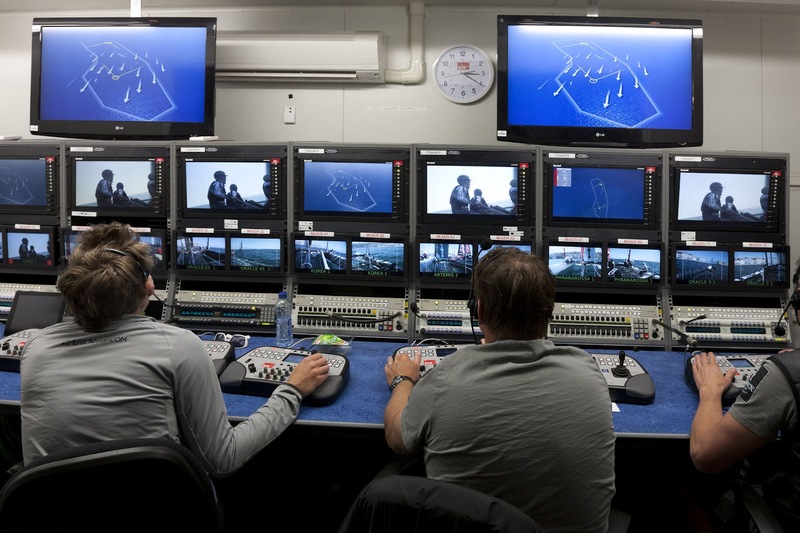 But that's part of the challenge, other than the other eight boats on the course, we have to deal with the weather. This will be one of those courses where the race isn't over until you get across the finishing line. Darren Bundock, skipper, ORACLE Racing Bundock: We've had some very good racing in practice in San Francisco (against ORACLE Racing Spithill), a little too intense at times, as we had that collision. But now there are eight teams we have to beat. We're fourth overall so we need to get past Emirates Team New Zealand and Artemis Racing and if we can beat all these other teams here that means we've got Jimmy as well and we'd be happy with that. Nathan Outteridge, skipper, Team Korea: I saw that Russell Coutts had posted on Facebook that America's Cup - Speed Trials; (the iphone and ipad app) was out, so I had a spare few minutes and downloaded it. I was thinking I haven't had much practice on the real boats, so I'd practice on the game at least. I've got my time down around 31 seconds now, so I've improved about four seconds. I need to get out on the water practicing, but this is the next best thing. Yann Guichard, helmsman, Energy Team: I hope we are ready. We didn't train on the AC45 in the winter, but individually we continued to sail in our own projects. Loick Peyron set a new record for fastest around the world. And on my side I launched the MOD70 and I've been sailing five days a week since January and there's also been an opportunity for the Energy Team crew to come and train on board the 70 foot trimaran with me. Fred Le Peutrec, skipper, China Team: It’s a great opportunity we have to sail on these fantastic boats, against these great teams. It's only our fifth day on the boat all together. We're still a very new team, there is only one guy who was with us last year sailing on the boat so we are working step by step, concentrating on manoeuvres and our own work on board more than the results - we'll see after. Max Sirena, skipper, Luna Rossa: I started my career working on the bow, and now I'm in the cockpit with an important role: It's a big honor for me and it's time to show if I can live up to that. It's a new era and you need the best athletes to be among the best. 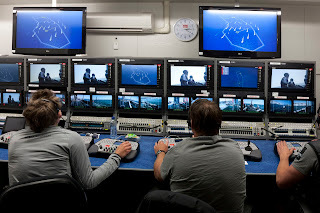 I was with ORACLE Racing during the last America's Cup, so I have some experience with the wing and one of my jobs is to transmit that to the crew. Chris Draper, helmsman, Luna Rossa: I think the biggest thing for Paul and me is (adjusting to) the enormity of the Luna Rossa experience. The support we've received is amazing and we're grateful for that, but it does raise expectations a little bit. We have some very wise and smart people in our team who are quick to point out this is our first event, we have not raced in the AC World Series as a team, so we're trying to keep our expectations in check. Paul Campbell-James, helmsman Luna Rossa: The AC45 and the Extreme 40 are very different boats. The style of racing is similar - close and tight, fast racing, but the boats are the biggest change. What gives us confidence is that Yann (Guichard) and Chris (Draper) have done a lot of their catamaran sailing in the Extreme 40s and they did very well in the AC World Series last year, so that gives us a bit of confidence.